BCW is a leading manufacturer of custom cabinetry for the commercial market in Phoenix, AZ and outlying areas, including Tucson, Prescott, Payson & Flagstaff. 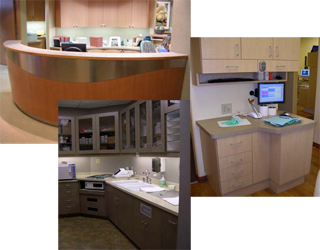 Our primary market is cabinetry for dental and medical offices. However, we build for any market that is seeking quality made cabinets at an affordable price. Our involvement in your project can run the gamut from building exactly as detailed in the plans, or we can aid in the design and lay out for your cabinets. Because much of our experience has been devoted to building dental offices, we have considerable knowledge of how dental offices function. We are happy to lend our time and knowledge to help layout the cabinetry for critical areas of your practice. We look forward to helping you with your up coming project.